Scratch off is a heat-process foil stamp that can be removed with the edge of a coin to reveal the information printed beneath it. A standard or custom shaped die presses the foil onto the surface, which leaves the foil in the specific shaped area. Traditionally, this effect is seen on giveaway and contest printed materials, but has several other creative uses as well. 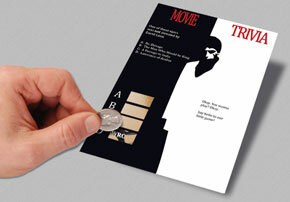 Some businesses develop trivia games or hidden story segments that are revealed only after the foil is removed. 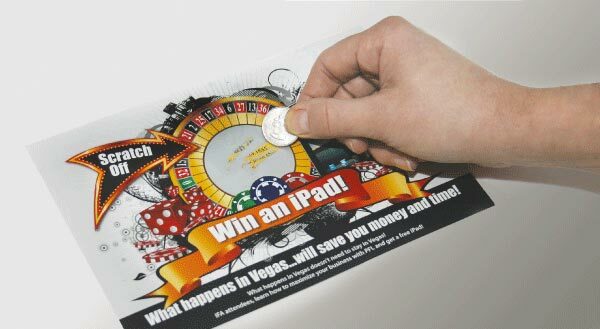 The Scratch Off concept contributes to the design originality of effective marketing materials. Consider incorporating an unusual shape, like a mustache or sunglasses, or fit the scratch off into a portion of the image, like the lenses of the sunglasses alone. Scratch off is a perfect method for increasing interest in your business cards, brochures, post cards, mail pieces, and newsletters. Speak with one of our knowledgeable customer advocates at 800-­930-2423 to get started with your scratch off print project. The options to generate engagement are limited only to your imagination. Consider the following features and benefits of a scratch off special effect as you proceed through the creative process. Gold and Silver Foil Colors to make your scratch off Pop. Variable Data for sweepstakes, pin numbers, codes, sequential numbering, barcodes, names, winning numbers, and names, locations, or images. Full Color printing on Premium Paper Stocks provides durability and the highest standard of quality commercial print. The selection of papers includes 100PCW-recycled stocks. Custom Shape Foil Stamps empower you to design an original piece that will leverage your print and mailing spends to get the best ROI. Plastic Scratch Cards: Print a PVC plastic card in credit card or business card size with a scratch off that conceals a pin number or other important data. Trade Show Handouts: Increase engagement with your handouts by conducting a big giveaway at the trade show. Each participant can scratch off to get a discount on future orders, or they may win a grand prize. Fundraisers: Supporter purchases a scratch off ticket for $1 to $5 then rubs off the foil to find out what, or if, they win. Trivia Games: Participants get a certain discount if they select the proper answer to the trivia question. Direct Mail Campaigns: Send fun advertising mailers with scratch off coupons or a contest element to win a prize that is redeemed at a store location. Gift Cards: Print on plastic or on cover stock with a scratch off that reveals the amount. Giveaways and Contests: Set up match and win or simply scratch to see winner cards for special promotions. Simply Call 800-­930-2423 to speak with someone smart, quickly.